The company was going in service with two vehicles, three coachmen and three conductors on 01 February 1865. The horse-drawn carriage traffic was running after the arrival of the trains from the railway station over the Railway high road and Neue Kreuzstraße to the Markt (market). At the beginning were offered four outward journeys and four returns. 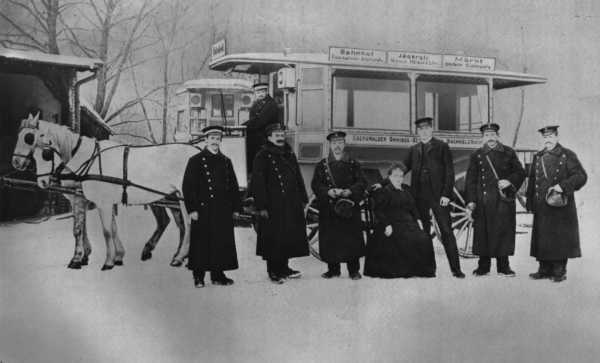 Contrary to horse-drawn carriages and stage coaches could the horse bus line decided more passengers to carry. Larger upward gradients, like in the Eisenbahnstraße of 33 ‰, raised trouble. They could be usually solved only by prestressing from additional horses. The speed of travel was accordingly low and amounted to about 8 km/h. They also must have some horses in reserve to change fatigued horses. According to the chronicle of the town the passengers must pay 1 ½ Silbergroschen (old German money) for the ticket. A piece of luggage cost additional one Silbergroschen. The Eberswalde horse-drawn carriage traffic line was lengthened to the Richterplatz in 1904. The Eberswalde horse-drawn carriage traffic was in service from 1865 to 1910.